It should come as no surprise to anyone that I love audiobooks. On long car rides, nothing helps me pass the time like listening to a good story. And Amazon’s fairly recent acquisition of Audible ensures that I can get audiobooks at reduced prices. If you purchase the digital edition of a novel, you can usually also get the audiobook version for cheaper than if you tried to purchase it separately. That’s what I did with Sabaa Tahir‘s An Ember in the Ashes. When the digital edition went on sale for $2.99, I snatched it up. Then, I got the audiobook for an excellent price, too. Another great thing about Amazon’s acquisition of Audible is Whispersync, which syncs your reading progress across multiple devices. For example, using Whispersync, you can go from reading on your tablet to listening to the novel in the car without losing your place. Whenever someone asks me about this book, I just direct them to the summary because I’m not great at explaining the premise of the book. With that being said, not even the summary does a good job of depicting the novel’s contents. I didn’t know what to expect from the book, but I don’t necessarily think that was a bad thing. The worldbuilding, too, was excellent. In little time, I found myself fully immersed in the world that Tahir creates. It was well-developed yet simple enough to grasp right off the bat. Having read some other fantasy-based novels with complex worlds, I was grateful that this one was easy enough for me to understand. I don’t want to say too much about this novel because I don’t know how to discuss it without spoiling much. All I will say is that this book is phenomenal and definitely worth the read. Tahir’s prose is lovely, and I look forward to reading more from her in the future. 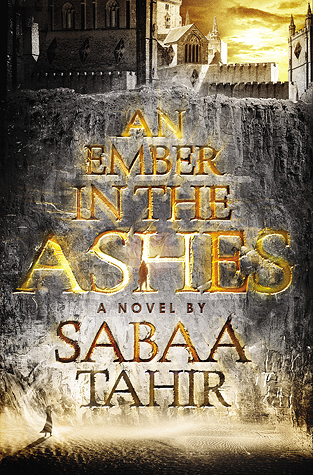 What did you think of An Ember in the Ashes? What book should I read next? So what was it about Laia and Elias that you found sympathetic and entertaining? How long did you read before forming a connection to these characters—did it happen in the first few pages or did it take a few chapters? Is this a self-contained story or the beginning of series? For Laia, I was able to sympathize right away. Tahir does an excellent job of showing her tragic situation, so immediately I wanted her to find a better life somehow. What I liked about Elias is his status as a “problematic fave” – in other words, he does some things that aren’t the most morally sound, yet he’s still someone I root for. He’s complex and engaging, and he really made me think. From what I understand, this is the first part of a series. I can’t wait to read the next book, though it doesn’t come out for a while! Hmm…not sure if I want to check out this book or not. On one hand the setting reminds me a bit of Cleopatra’s Moon, but that book was deeper into the history aspect than this book seems. And I felt like I’ve been burned by the last few fantasies I’ve read—too much focus on world-building and not enough on character development and writing quality. It has so many good reviews though… I don’t know. Guess I’ll chew on the thought. Anyway, thanks for the reply! Oh – I DEFINITELY felt like there was more focus on character development than wordlbuilding here. Character development is very important to me! If that’s what you’re looking for, you really should check this one out! Okay, I’m going to check it out. I’m flattered that you value my opinion! 🙂 And definitely give it another go!